Lori grew up near Seattle, Washington, which is known to be an area that inspires a melancholy mood in winter and complete appreciation for life in the summer. This music reflects many moods. After moving to California and forming a band called Strata, Lori’s path led her across America to Washington, DC. Here she found solace in writing and recording the songs on this album. You can feel the influence of these locations in her music. Her songs seem to draw beauty from the depths of your soul and open your heart to possibilities. They were written during a time in Lori’s life when she was seeking an escape from her hectic daily existence. The first song is an expression of longing on the surface, however on a deeper level it is really the key to unlocking the rest of the album. Lori Hawk’s voice permeates the darkness in the haunting “listening for you.” In absolute longing, her voice echoes from deep within the caves of the heart and soul. It seems to move up and out and to the top of a mountain. Princess Mary is almost playful until you actually read the words and contemplate the deeper meanings. After the first two songs, fascinating lyrics start to weave through your mind like a river gently inviting you into deeper contemplation. You are immersed in each story as the almost living lyrics lead the rhythm in the songs. While this is alternative, her music has a lyrical magic all of its own. There are definite interweaving of new age, modern folk, rock, Celtic and Eastern influences. 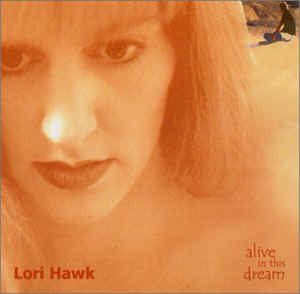 Lori’s voice is free to dance within a world of keyboards, acoustic guitars, drums, Didjeridu, tar, riqq and buffalo drum. The music follows her and envelops her voice willingly on this musical pilgrimage. Alive in this Dream is actually a collection of songs focusing on recurring themes and patterns. Lori came to a realization that people around her were going through similar struggles. Alive was born during the realization that we often shield ourselves from the truth in a intellectual dance. Once you know this song was written after Lori watched a friend avoid a relationship she really wanted to have, it just opens up into story of love that seems inevitable. She paints images of letting someone walk away in the rain and the angst that follows. You move from an ethereal trance of idealism to a realization of being awake in the dream of your own making, reality. Lori Hawk’s creativity and poetic expression defies classification. Her voice is sensuous, clear and stunning in its power. Yet, in a whisper, her voice can change into a comforting delicate beauty that can slowly intoxicate you unlike any other music I’ve experienced. This is especially true in “As You Hold Me.” Her lyrics are beyond compare. It has taken me weeks to see the deeper meanings and this fascinates me. For the Kings has a surprisingly powerful moment of rhythm that bursts from the calm. Lori’s voice seems to take off into an ecstatic dance across the Egyptian night sky. This seems to display her love for being unconfined by rigid structure. I really have been listening to this CD for weeks and I’m rather addicted. I hope Lori has more albums in the making because her music is superior in quality and spirit. Alive in this Dream is a lush collection of memories, longings, dreams, poetry and creative images of nature woven between pure ripples of sound.